The fifth event in the 2018 Wednesday Evening Series will be held at Seattle Pacific University. The Wednesday Evening Series is our most relaxed, casual set of navigation events, held in local parks once the weather warms up. These events are a little more low-key than those in the WIOL/Winter Series, and we typically offer a barbeque afterward for all participants. Decompress after work, with or without your coworkers. Or meet your family at the park and enjoy a night off from cooking. Or meet a bunch of friends at the park for an evening of exploring together, chatting over some food, and finishing up with frisbee on the lawn. Note that as Course 4 is a combination of Courses 2 and 3, participants will go through a map exchange between the two courses. Instead of punching the finish after completing Course 2, simply return to the start area, drop your Course 2 map, pick up a Course 3 map, and resume navigation. 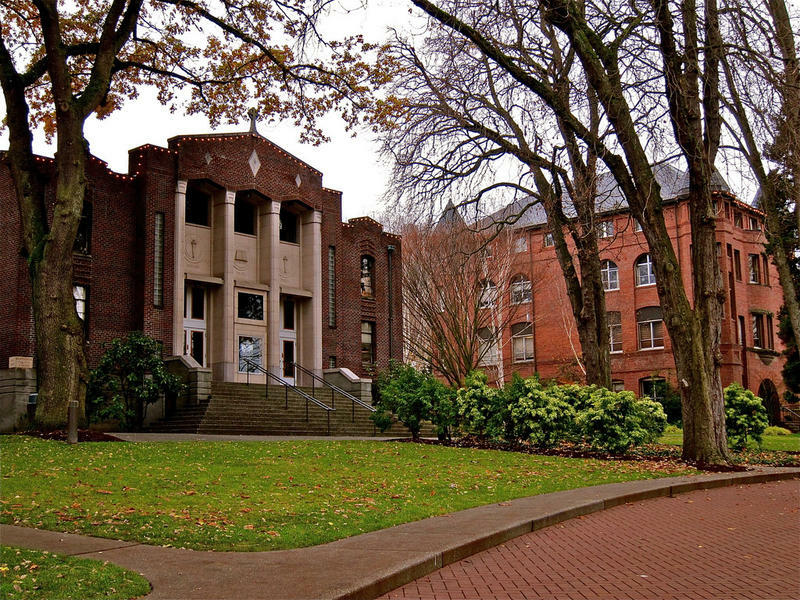 Seattle Pacific University is located at the northern foot of Queen Anne hill, and is a highly complex urban venue. You won’t find any forests here, but you will find many buildings, walls, small passages and tight corners – all of which call for careful map-reading and quick decision-making. There are several streets that criss-cross through the map; these are generally not busy, but please do exercise the usual cautions when crossing. As this venue is a college campus, please also watch for and avoid students and other pedestrians. The rules dictate that no competitor may enter an area mapped as olive green. The rules dictate that no competitor may cross any wall, fence or other linear barrier mapped with a thick black line. Not to worry, though – if you have any questions about these rules before you start your course, meet staff and/or other orienteers will be happy to help! Turn right (north) onto Westlake Avenue. There is no designated parking lot for this event, but there’s ample street parking near the intersection of 3rd Ave W and W Cremona St. Registration, start, etc. will be within view on the campus lawns just west of that intersection.